An Unidentified Digimon that suddenly appeared on the Computer Network. The aggression generated by the malice of people who abuse the Computer Network, and the conflicts which are unfolding on the Network, manifested and a single DigiTama was created. 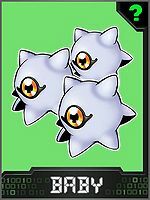 Humanity's destruction instinct is condensed within that DigiTama, and as such the mysterious Digimon that was born from it is a very dangerous being. It multiplies like a virus within the Computer Network, causing a slight degree of network failure. 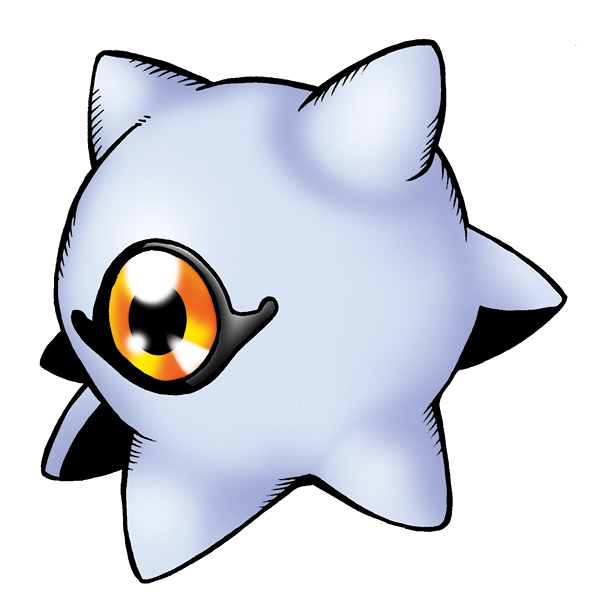 Its Special Move is producing a frothy substance from its gigantic eye (Glare Eye). n., From kurage 「水母（クラゲ）」, which means jellyfish. Produces froth from its eye. Fires a ball of light from its eye. Awa  Bubbles 泡 N/A Bubbles Spits out bubbles from its eye. A Kuramon hatch from a Digitama formed on the Internet from a collection of viruses. Appears at the beggining of the race cheering up the contestants. 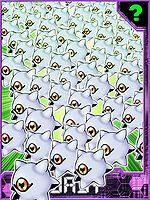 Thousands of Kuramon created by Diablomon emerge into the Real World through cell phones and computers. Groups of Kuramon serve as recon for Mercurymon. Kuramon is no where to be found, but can be reversal evolved from Guilmon from Cliff Valley. It can evolve to Guilmon if above level 8 and Attack above 65, Keramon if above level 8 and Darkness EXP above 500, or Muchomon if above level 7. 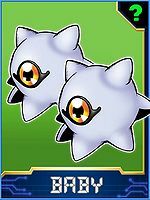 Kuramon is an #9 Digimon and it's an HP-class Dark species Digimon with a resistance to the Dark element and a weakness to the Light element. Its basic stats are 65 HP, 65 MP, 34 Attack, 28 Defense, 39 Spirit, 29 Speed and 15 Aptitude. 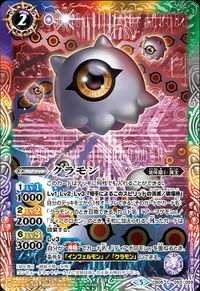 It possesses the Dark Whisper 1 trait. It dwells in the Magnetic Quarry and it's treated as an Baby II Digimon. Kuramon can evolve into Tukaimon. In order to degenerate into Kuramon, Tukaimon must be at least level 3, but only if you have previously befriended a Kuramon. It can also be hatched from the Calamity Digitama. It is also one of the Digimon the player must fight to become a Platinium Tamer. 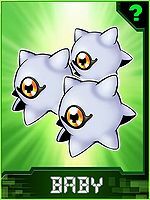 Kuramon is only obtainable as a collectible card. Its card is part of the The Wickedest Virus (最悪のウイルス Saiaku no Uirusu) set. 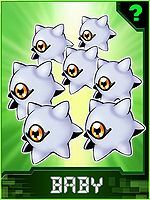 Kuramon is an unobtainable boss Digimon. 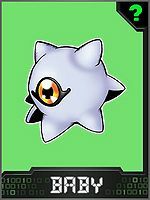 Kuramon is one of the Baby-level Digimon available to the player. However, it should be noted that Kuramon's Digitama is, unlike the rest of them, unavailable at the start of the game and must be unlocked. In order to do so the player must first beat the game and then follow the post-game scenario until defeating Armagemon. 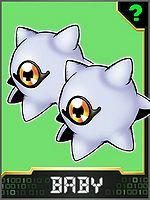 The egg from whence Kuramon hatches is white-colored with a black diamond pattern on its lower half. Kuramon evolves into Tsumemon. An Unidentified Digimon that suddenly appeared on the Computer Network. This page was last modified on 22 March 2019, at 20:07.